We live in the age of the Internet. Whether it's your personal life, business, hobby, or whatever, you can almost guarantee that it will be documented on the internet in some sort of social media platform. It is one of the most useful tools for an emerging business, or it could actually be your business. There are many different ways to use social media to your advantage, but there are wrong ways and there are right ways to do it. When I started Famous Last Words we still were in the ancient days of MySpace. MySpace will forever be my favorite social media platform solely because of how customizable and personal you could make it. You could create pretty much an entire webpage for your brand. You could have embedded music players. You could basically have your own website, but without having to purchase a domain. But just like everything in life, social media evolved. Now we have things like Twitter, Instagram, and of course Facebook. That's lesson number one; Social media and most things in the industry are ever changing. This isn't necessarily a bad thing either. It's only a bad thing if you are the kind of person to get stuck in your old ways and refuses to accept change. But if you can accept change and grow with the ever-changing madhouse that is social media, then you can really use these platforms to your advantage. I founded and sing in Famous Last Words. I am also the one who runs all of our social media accounts. Over the years I have learned a lot of tips and tricks of social media that have really helped me grow the band. Needless to say, half of those tips and tricks are completely irrelevant now. But instead of getting upset about how a nifty little secret I figured out may not work anymore, I look at the tools I have and take advantage of them in the most proficient way possible, and find new tips and tricks all the time. This cycle is never ending. Social media gives you a truly incredible opportunity to promote your brand to people all across the world and grow a much more personal and intimate relationship with your fans/customers along the way. 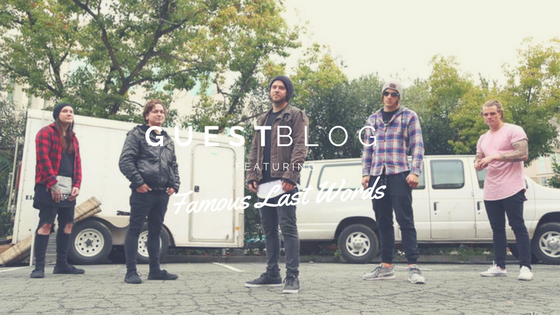 Right now Famous Last Words is on tour with the Canadian artist, Manafest. We have used social media primarily to promote this tour. Nowadays, many of the platforms offer really awesome tools to help you promote your brand. There are analytics sections, so I can keep track of how our audience is perceiving and reacting to our content. There is live streaming now so we can go live with our fans literally whenever we want to. And there are also ad services, which cost money, but can be worth it IF YOU DO IT RIGHT. With geo-targeting and hashtags you can make sure that your posts on your socials are reaching the right demographic of your fan base. For example; If we are doing an east coast U.S. tour, I wouldn't want the ads I'm paying for to run to our fans in Europe or even the West Coast of the U.S. for that matter. With hashtags, you can help put your posts in the correct algorithms to reach the audience you want to reach. Say we are playing in New Jersey for a show and I do a post for it. I'm gonna do tags like #famouslastwords, #tour, #NewJersey. I'd even go as far as tagging the city and venue as well. And this is the same for Instagram and Twitter too. One of the toughest obstacles to get over is over saturating your socials with the same tour flyer or the same content OVER and OVER again. This will turn your fans off from wanting to stay up to date with your pages, because it goes from being an update to spam very quickly. A good way to get around that is posting different types of content like live shots from shows, videos, and so on. As long as you mix it up and keep the posts interesting and engaging, you should be just fine. It's also very important to pay attention to the analytics section I mentioned earlier. This will help you figure out what your audience likes to see and when they like to see it. Sticking to a good schedule and making sure everyone who has control of the socials knows the schedule is the best approach. One of the reasons I run the socials almost solely on my own, is because it wouldn't be good if I posted something and then another admin hopped on and posted the same thing right after me, or even something different for that matter. You have to make sure your posts are timed out correctly in order for them to reach your fans to the fullest potential. A good way around this is scheduling posts ahead of time. Facebook lets you schedule posts already, but for Instagram and Twitter, there are awesome apps you can get for scheduling. I personally use "Apphi Post" and "Everypost" for Instagram and Twitter but there are tons of social media apps out there to help you manage all of your accounts. Although social media is an incredible and extremely vital tool for the success of your business or band, you can never forget to keep using some old school tactics. You need to go out and promote yourselves. For bands, you need to go to shows, conferences, festivals; anything to get some face time in. Because at the end of the day, no matter what you see on social media, you are still looking at a screen. Nothing beats looking into someone's eyes and networking face-to-face. THAT is where real and lasting relationships are made. Try to think of social media more as a stepping stone to help get you to that next step of real, personal networking instead of the be all end all tool. But like I said earlier, the tips and tricks are ever changing, so to stay ahead of the game, you need to be ahead of the game. Always be looking out for new ways to promote your company because who knows, in a few years we might be looking at Twitter, Instagram, and Facebook the same way we are fondly reminiscing about MySpace... a thing of the past. It is up to YOU to continue to push forward and evolve and change the world.